The Upper Boggy Creek neighborhood, also known as Cherrywood, (and just down the road a piece from Wilshire woods) is an eclectic and established neighborhood interwoven with older homes in various styles, local restaurants and coffee shops, and small parks. Shady, tree-lined streets and a proximity to the University of Texas means that the neighborhood attracts families, students, and single professionals who enjoy a close knit, friendly atmosphere. New local businesses often find the area attractive as well. 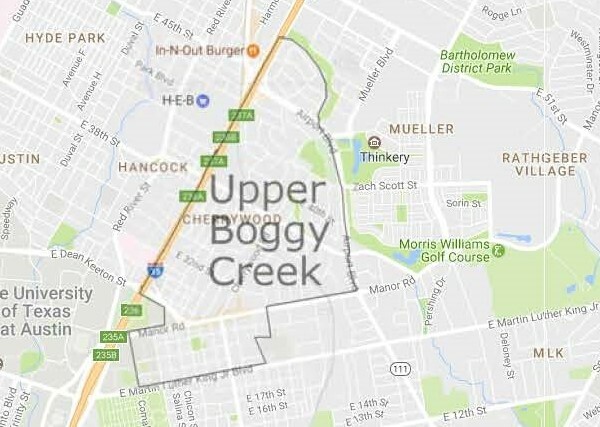 Located north of downtown just of east of IH 35, Upper Boggy Creek is roughly bounded by IH-35, Airport Blvd, and Martin Luther King Blvd. Once orchards and farmland, the neighbor was transformed into a residential community through the 1960’s and many of the original ranch style homes and bungalows remain. In addition to popular restaurants and coffee shops, businesses in the area include various art and healing art studios and clinics. Manor Rd. serves as “the main drag” for good reason. Austinites travel from near and far to enjoy restaurants like The Salty Sow, Dai Due, and old standbys like Eastside Café and Hoover’s Cooking. Not to mention Vortex Reperatory Co., an innovative little performing arts theater that produces original & non-traditional theater works and community events. For a unique neighborhood that combines both old and new Austin, be sure to check out Cherrywood! As if in.gredients’ ethos isn’t enough, they offer a plethora of other amenities to the Upper Boggy Creek & surrounding communities. Community art shows, live music – including kid’s concerts!, Zumba fitness classes, and even bug eating festivals (you read that right) – in.gredients encompasses everything fun, conscientious,healthy, and weird about Austin. Check out this delightful space. Bring your dog, order yourself a kombucha and kick back at one of the picnic tables out front – or maybe you’d like to a bite from their fresh-as-the-morning-sunrise menu. Can’t go wrong.